Abstract. The Sustainable Rivers Audit (SRA) is a systematic assessment of the health of river ecosystems in the Murray–Darling Basin (MDB), Australia. It has similarities to the United States’ Environmental Monitoring and Assessment Program, the European Water Framework Directive and the South African River Health Program, but is designed expressly to represent functional and structural links between ecosystem components, biophysical condition and human interventions in the MDB. Environmental metrics derived from field samples and/or modelling are combined as indicators of condition in five themes (Hydrology, Fish, Macroinvertebrates, Vegetation and Physical Form). Condition indicator ratings are combined using expert-system rules to indicate ecosystem health, underpinned by conceptual models. Reference condition, an estimate of condition had there been no significant human intervention in the landscape, provides a benchmark for comparisons. To illustrate, a synopsis is included of health assessments in 2004–2007. This first audit completed assessments of condition and ecosystem health at the valley scale and in altitudinal zones, and future reports will include trend assessments. 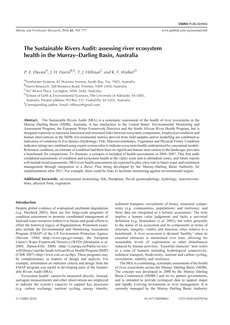 SRA river-health assessments are expected to play a key role in future water and catchment management through integration in a Basin Plan being developed by the Murray–Darling Basin Authority for implementation after 2011. For example, there could be links to facilitate monitoring against environmental targets. environmental monitoring, fish, floodplain, fluvial geomorphology, hydrology, macroinvertebrate, physical form, vegetation.